Los Angeles - From the podium at the Staples Center, Karenna Gore Schiff today announced the launch of AlGore.com. This new site stresses interactivity and facilitates virtual participation in the campaign. Schiff's announcement will be available to voters and press via the Internet. The web site offers voters the opportunity to learn about the values and vision of Al Gore and his running mate, Joe Lieberman. Visitors can participate in an "Interactive Town Hall" or study up on the most important issues facing working families. "I hope that every voter across the country visits our new website -- www.algore.com," said Gore. "In one place they can find everything they need to know, not just about me and my running mate, Joe Lieberman, but also about the important issues in this campaign." Schiff is the head of GoreNet, a network of young people working to help elect Al Gore and Joe Lieberman. She has been campaigning on her own and building a network of young people across the country to support her father. "Information is crucial to voters when choosing a candidate," said Schiff. "That's why I am excited about the launch of AlGore.com. It gives visitors the opportunity to learn where my father and Joe Lieberman stand on the issues." Ben Green directs Internet operations at Gore 2000. He helped design the innovative "Interactive Town Hall," where voters can submit questions and see responses from the candidates. "Voters are beginning to focus on this election. AlGore.com provides an opportunity to participate in the campaign and make a decision," said Gore 2000 director of Internet operations Ben Green. "This new site sets the standard for Internet campaigning and demonstrates Al Gore's commitment to working families." 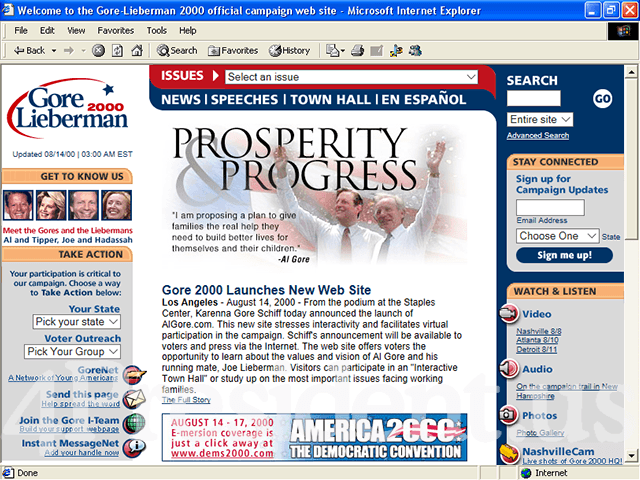 The new site is designed to serve a broad audience of Web users: supporters looking for information and opportunities to participate in the campaign; activists using the Internet as a means to mobilize voters; and undecided voters looking for more information on how Gore and Lieberman will fight for working families. The site offers voters a broad range of Take Action opportunities, which allow supporters to participate actively in the campaign. Through these Take Action opportunities Web site visitors can: volunteer to participate in local campaign events; create custom Web pages with pictures and text to mail to friends; send links to Gore 2000 Web pages to friends; register to vote online; and join Women for Gore's "Winning the Difference" e-mail project. The site's Interactive Town Hall allows Web-surfing voters to submit questions to Gore and Lieberman. Selected questions will be answered by Gore and Lieberman and posted on the Web site. On the site's Build Your Own Campaign page, Web visitors can contribute their views, sharing their passion about the issues facing working families. Each of the fifty United States will have its own homepage that will feature issues and events important to that state. At the top of each Web page is a link to a Spanish translation, which features the same look and feel of the English language page. The new website can be accessed via www.algore.com, www.algore2000.com, and www.gorelieberman.com.